That was fun! My first tour of Hayes Valley turned out well, and there were even folks who loved the game we played—more than two dozen, in fact. Last weekend’s tour was different from a usual Thinkwalk. 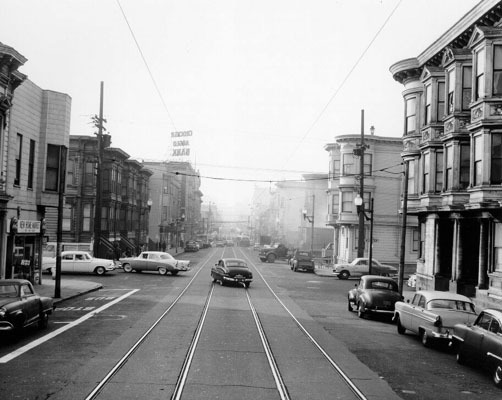 This 1958 photo shows how narrow Geary was before the 1970s "redevelopment" of Geary into a wide boulevard with tall apartment buildings. Cross street is Webster. Josh Bingham and Matt Garcia from WalkSF, our local pedestrian advocacy group, drew me into a madcap scheme to do something out of the ordinary. They suggested a scavenger hunt. But, given that my research is always trying to fill in where no others research, how could I do a game that follows the fads? I had to invent my own. With their cajoling and coaching, a new game emerged. Caption walc stands for Walking Around Linking Clues. Okay, not so clever. But it was a chacne for a tour that incited interaction among the participants. The group dynamic was excellent to watch. Instead of holding up photos, I passed out image cards and people made captions for them based on the tour presentations. They judged one another’s captions for cleverness and we had prizes for points, and for caption dramatic readings. Jym Dyer won the grand prize: a framed print of an 1868 George Goddard birds-eye view of the Bay Area. 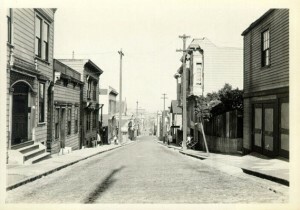 Lots of pictures were part of the presentations and people learned about a few things, such as the tunnel that was proposedf to go under Pac Heights on Fillmore Street in 1913, the breweries that were once at Webster and Grove, and the creek headwaters that are visible as springs in Alamo Square—still. Most of these photos were not used in the game, so even if you came on the walk…I mean walc, this is new to you. 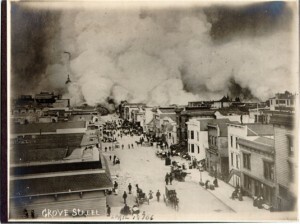 The 1906 quake caused major fires. Here's one raging on Grove street. After moving to Hayes Valley from 4th & Market, St Ignatius College and its church dominated the area. That ended with the 1906 quake, which took down both church towers. 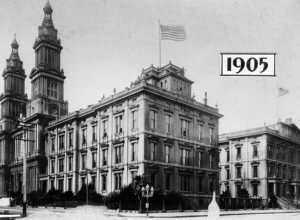 The college, becoming USF, moved to its current location on Lone Mountain after the huge loss. 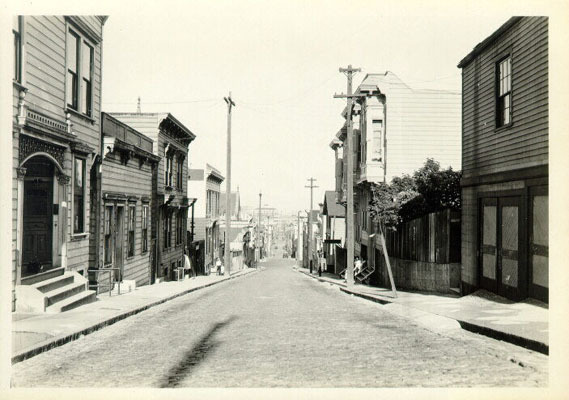 When Linden street was young, it was cobbled and named "Avenue"! Next article: Keep those awards comin’! Leave a Reply, Question or Comment.